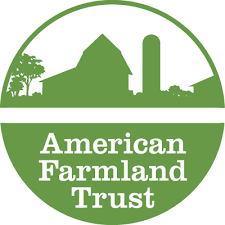 Having an American Farmland Trust (AFT) office in DeKalb County Farm Bureau’s Center for Agriculture made good sense with their move here a couple of months ago. There are several parallels between the two farm organizations. Soil health was the basis for forming the county’s Soil Improvement Association, forerunner to Farm Bureau. Soil health is one of the initiatives of AFT. AFT also works closely with the NRCS (Natural Resource Conservation District) and SWCD (Soil and Water Conservation District), which have offices in the Farm Bureau Building. 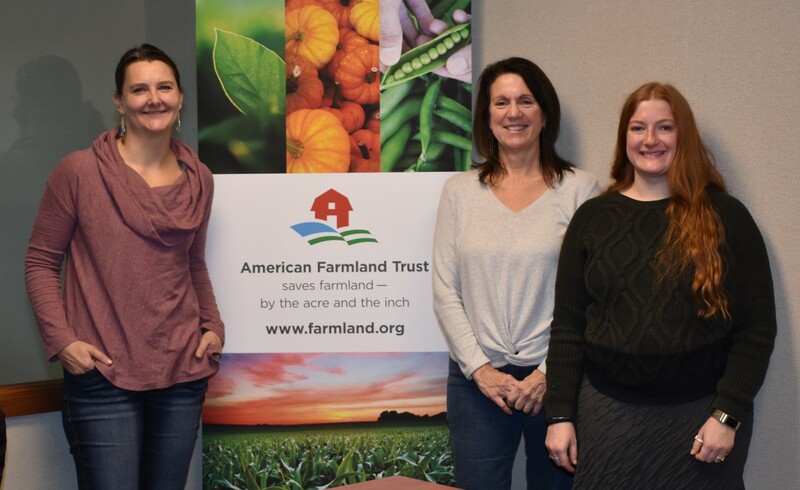 Meet the American Farmland Trust staff located in the northwestern office space of the Farm Bureau Center for Agriculture – (from left) Jennifer Filipiak, Midwest Regional Director; Teresa Bullock, Office Manager/Program Assistant; and April Opatik, Programs and Outreach Specialist. Both organizations advocate for farmers and programs that protect farmland and the environment. Jennifer, a Belmont, WI resident, works from her home office and travels between the Midwestern offices. She has been with AFT since 2013. As the regional director, Jennifer works with farmers on AFT’s Soil Health Initiative, Women for the Land program, the Illinois Sustainable Ag Partnership, as well as leading other programs and implementing policy strategies. Teresa Bullock of DeKalb is the office manager and program assistant, a job she has held for the last 24 years. She provides staff support and AFT coordination during office hours of Monday through Friday, 8 a.m. until 4 p.m.
April Opatik, a Baraboo, WI resident, is the programs and outreach specialist for AFT. She works out of her home office and travels between the Wisconsin and Illinois offices in her communications role which she has held for two years. She produces newsletters and promotes AFT through various mediums. Other AFT staff will also be frequenting the Sycamore office for conferences as well as using common meeting space at the Center for Agriculture.